Hudson Ice Floes Before we even begin discussing the Mississippi, I have a comment on the Hudson. In the two decades I've lived on the Hudson, I've only seen ice floes 2-3 times, and then only for a day or two each time. This year has been phenomenal. It's been particularly cold, and as I begin to write this posting in late February and early March, ice floes have been passing for the past month or so, day after day. While they're drab in dreary weather, in the sun they're beautiful. They're usually only on the eastern, Manhattan side, sometimes a third or half way across the river to New Jersey. Perhaps it's the wind that causes that. Some floes are rather large, but most are medium to small, and there's even a lot of slush appearing between them. I've also heard that there have been ice breakers way upstream, so that barges could deliver supplies, notably home heating oil. These are ice floes in the sun in front of North Cove. Click and watch how nice it gets. All the nearby buildings are the former World Financial Center, now renamed Brookfield Place. Behind the curved Winter Garden in the lower left is the newly completed One World Trade Center, which I can see off my back terrace. But the real spectacle here is the Hudson ice. Now back to the subject at hand, the Mississippi River. Follow on the map how we're driving, as we speak, from Galveston via Beaumont, Lafayette and Baton Rouge up the Mississippi River to Natchez. Why Natchez before we get to New Orleans? Of the four directions outside of New Orleans, I already went east at the time of the Mardi Gras visit in 2008. (One Mardi Gras is enough! I'm not a party animal!) In 2008/2, I described driving east along the Gulf Coast into Mississippi to see Gulfport and adjacent, but not shown, Biloxi (say "-lux-"), and then beyond into Alabama to see Mobile and Mobile Bay. I didn't have to go any further, since I'd visited Pensacola in the past coming north on the Gulf Coast out of Florida. Later that same day, I turned around, drove back through New Orleans, skipped going south to the river delta for lack of time, and drove west to New Iberia, just beyond Morgan City (see map), for the nicest part of the entire 2008 New Orleans trip. That was when I did the following visits in three days: (1) a visit to Avery Island to see where and how they make Tabasco sauce, a major visit on my bucket list; to the beautiful mansion Shadows-on-the-Tèche (Photo by Carol M. Highsmith) in New Iberia, owned and operated by the National Trust for Historic Preservation, of which I am a member, and got free entry; and a second (after 1969) and much more complete visit to St Martinville's Evangeline area in the Cajun Country. This was followed by a visit to seven Plantation houses on the River Road on both sides of the Mississippi (also known as "Plantation Alley") over two days: (2) a first day to Destrehan Plantation (Photo by Elisa Rolle), Oak Alley Plantation (Photo by Emily Richardson), Laura Plantation (Photo by ZeWrestler), and Nottoway Plantation (Photo by Bogdan Oporowski), staying the night in the magnificent Nottoway and getting invited to join a pre-wedding dinner with some strangers; and then (3) a second day visiting San Francisco Plantation (Photo by Bennett-ne), Houmas House Plantation (Photo by Frank Kovalchek), and Madewood Plantation (Photo by Elambeth), and staying the night in beautiful Madewood—my bedroom was on the upstairs balcony at the right end. If any of these three days of events intrigues you, consult 2008/3-4. Note: if the Laura Plantation house doesn't look as grand as the others, it's because it isn't. What's special about it is that it's called a Creole Plantation, and was run by locals, average people. Still, they owned slaves, but the six restored slave quarter buildings behind Laura, which a museum there fully explains, are rather unique, perhaps just as interesting as the main building, if not more. Well, with east and west of New Orleans taken care of, that left south and north. South to the river delta was an easy decision, since I'd skipped that in 2008. But what about north? Going north would mean going back into Mississippi, of which I did not have the happiest memories. In our Grand Tour of the eastern US and Canada in 1969, the one where we first visited both Evangeline sites, Grand Pré in Nova Scotia and then St Martinville in Louisiana, according to our travel diary, we drove to Natchez, looked at some plantation houses there just from the outside, because of lack of time, took a quick peek at the Natchez Trace Parkway, stopped in Vicksburg and visited the Military Park, and then crossed into Tennessee to stop in Memphis and drive down Beale Street. I remember not one single bit of this. I vaguely remember stopping in Memphis, but not that we saw Beale Street. What I do remember very clearly was that we were driving north (leaving Natchez perhaps?) in the dark. I don't remember why, maybe we were looking for a campsite for our VW Camper. As we were driving, we were stopped at not one police roadblock—which would have been a first for us, anyway—but four police roadblocks, all in Mississippi. I don’t know why but this was the civil rights era in the 1960s and the Deep South, particularly Mississippi and Alabama, was not a good place to be. So road blocks I remember, visits nary a one. A mental block? Perhaps. Thus it was actually with great trepidation in 2008 when I crossed the Mississippi state line from Louisiana to go to Gulfport and Biloxi. But life seemed normal there. So maybe life would be normal on this Gulf Trip if I went back north into Mississippi. After all, I'd gotten to actually like Texas. Maybe I'd give Mississippi a shot. I'm pleased to say that everything worked beautifully. I'm not ready to say that there's a perfect world there, nor anywhere else in the US, but life was normal. I met blacks and whites working together, listened to normal radio stations on the car radio, and felt quite at home. And there's a monument at Ole Miss to James Meredith, commemorating his bravery in integrating the university. I also read that some of the private schools that were set up to avoid public school integration take qualified black students today. I have another indication of normalcy, but next door in Alabama. I read in the Times that, when they were shooting the film "Selma" in Selma, they were looking for extras for the crowd scenes. They found plenty of black extras, but white ones were harder to come by. One young white man who was interviewed said what happened then was so different from the way he lives his life, that even just portraying one of the local policemen who broke up the crowds was far more than he wanted to do, although he did yield to play one of the state troopers who were more in the background. It's a different generation. So I made the decision to go north, to really see Natchez, the Natchez Trace, Vicksburg—and Oxford, where the University of Mississippi (Ole Miss) is located. I was not necessarily planning on going up into Memphis. However, this route north would mean backtracking south to New Orleans, because I wanted to take the City of New Orleans from its very first stop. Lower & Upper River Trips Become One Story But hold it! The trip category got extended in medias res / right in the middle of things. While I was on the American Queen, they "made me an offer I couldn't refuse" to sail with them again under advantageous circumstances. I chose the Upper Mississippi for this coming September. So the second part of the Gulf Trip last November now becomes another trip ten months later starting in September, and "Lower" and "Upper" become less important for the new rubric "Mississippi River". And so, Natchez is our goal for the moment. In 2008, when in this area we talked a little about the Mississippi, as well as about two of the local bayous, Bayou Tèche (TESH), where both the St Martinville Evangeline site and Shadows-on-the-Tèche are beautifully located, and Bayou Lafourche, which is steps across the road from Madewood Plantation. But now that we're talking about the whole river, and also now that I've learned more, we should do an updated summary, of the quirks of the Mississippi. There are many smaller rivers here, and it would be a fool's errand to name even all those you're heard of, so let's stick to the big rivers. In addition, as we review this, you'll begin to see why the Upper Mississippi and Lower Mississippi are considered separately, and why the division is considered to be at Cairo, Illinois, where the Ohio joins it. Picture the Lower Mississippi, from Cairo to the Gulf, as the principal river here, the catchbasin for all the others, including the Upper Mississippi. This view is typical of the alternate view, that the Tennessee is important enough, even though it enters the Ohio, and not the Mississippi, to consider it separately, and also that the Arkansas-White-Red rivers form one basin, even though the enter the Mississippi separately. I was amazed when I saw this, and I hadn't guessed all that well. Although the Missouri River watershed is by far the largest of the subbasins, an incredible 2.5 times larger than the next largest--flip back to one of those maps to confirm this--the Ohio River discharges 3 times more water than the Missouri. There's an old joke from the steamboating days, about the problem of lack of water when navigating the Missouri, that it's "a mile wide and an inch deep". As a matter of fact, the Ohio discharges more water than any other watershed, fully 38% of the water that reaches the Gulf. That means that, when you look at the Mississippi in New Orleans, more than a third of what you're seeing is Ohio River water. The Upper Mississippi, working as a separate, smaller river, delivers only 19%, which means that, when you stand at Cairo and watch the rivers merge, with the Ohio putting in 38% and the Upper Mississippi 19% to the blend, twice as much water is coming from the Ohio as from the Upper Mississippi into the Lower Mississippi. The next highest contributors are the Missouri at 13% and the Lower Mississippi itself, also delivering 13%. Behind that comes the Arkansas/White, then the Red, with far lower amounts, so little that, when drawn to scale, they hardly show up on the waterflow map at all. On the other hand, you can see how much the Tennessee contributes to the Ohio, enough so that some consider it separately. While the regular river map, and the watershed maps, are geographically interesting, the freshwater discharge map really tells the story. You can tell why the American Queen Steamboat Company, typical of others in the past, offers cruises on the Lower Mississippi, the Upper Mississippi, the Ohio, and the Tennessee—and not on any rivers whose watersheds lie to the west. We have purposely neglected to tell why this map shows two separate discharges from the Lower Mississippi into the Gulf, the smaller, but considerable one, being labeled the Atchafalaya River. That's another one of the interesting facets to the Mississippi that we'll now get into. The Quirks of the Mississippi The Mississippi has two notorious quirks that few other rivers have. It meanders and it switches deltas. A meander is an easy concept but switching deltas? The river changes where it's going? Ah, yes. Welcome to the quirky Mississippi. A river that flows straight—the Hudson is an example, has a straight riverbed that doesn't change, although the water might weave its way through it. If the riverbed is a bit serpentine, a weaving river within its banks still is little to make a fuss about. But rivers like the Mississippi are in full control of their riverbed. The muddy river—that's just the point--goes wherever it wants to on the flat floodplain, and the riverbed has to follow. The Mississippi moves slowly, and is notoriously full of silt (hence the sobriquet "muddy Mississippi"). If a sand bank develops in its path, the river might find a new route around it, and begins meandering. Each meander has a peninsula of land within it, from whichever bank it's heading away from (see drawing). The river deposits silt on the sides of the meander, raising its bed, and when the next flood comes, the river might cut a deeper short cut around the meander by cutting a new channel ACROSS the peninsula, and the peninsula becomes an island. Rarely, such an island may last, but more likely, the old, looping channel will dry up, and the island ends up being attached to the opposite riverbank. This is particularly startling, since there are usually two different states on opposite sides and a piece of one state becomes an enclave within the other. This very rough sketch shows the northern parts of Louisiana and Mississippi facing each other across the Mississippi River. You can see where the river is today, and where it has been in the past (in red), particularly when the state lines were drawn up. You can see pieces of each state that are now on the "wrong" side of the river. You can also see oxbow lakes, or remnants of some, where there used to be loops. Both Natchez and Vicksburg are shown here, but this is a rough sketch and Vicksburg should be drawn further north, more near the top of that red loop. This is important, because today, Vicksburg is not on the Mississippi any more, or at least the bulk of the city isn't, just the southern suburbs. That red loop, which includes a piece of Louisiana on the "wrong" side, is what the city overlooks. In the Battle of Vicksburg in 1863, that loop of water was what it was all about, but today it's gone. More explanations when we get there. Today's river is in the foreground, and you can see where the Missouri has been over the years. It appears that the river bed of 1870 was the basis for the state line and today's Carter Lake. DELTA SWITCHING Go back to that rainy window pane with the meandering rivulet. Picture how it never reaches the bottom of the pane at the same spot. Sometimes the whole thing swings left, then right, then comes down the center, then keeps switching like it can't make up its mind where it wants to go. That's the situation with the Mississippi, although it switches by taking its time over millennia. This flip-flopping is called delta switching, and the Lower Mississippi has joyfully taken part in that activity very regularly. As with meandering, it has to do with all that silt. Sediment begins to clog the channel, raising the river level and causing the river to try to find a steeper, more direct route to the Gulf. Over time, this has happened every 1000-1500 years, although since the extensive leveeing of the Mississippi in the 1930s that tendency has diminished. Part of this process is something very typical of the Mississippi. We know that rivers flowing INTO a larger river are called tributaries—think of the image of a vassal paying tribute to a lord, but in this case, the tribute is water volume. But it's not rare for a river like the Mississippi to have just the opposite, a distributary, a small river flowing OUT OF it, like a vassal changing his mind, taking a pile of tribute—water in this case--and finding his own way. It's as though a large river sprang a leak, like a water pipe, or garden hose, where some water doesn't make it to the end of the pipe or hose. Now combine the thought of a silting-up Mississippi looking for release elsewhere with a distributary taking its own route, and you'll see how delta switching works. Remaining distributaries might continue to exist, fully or even partially, or dry up. Some of the remaining diminished distributaries are then referred to as bayous, so typical of the Gulf coast of Louisiana and Texas. A bayou, which can be so beautiful, can be a slow-moving residual stream, or spread out into a marshy lake or wetland. The word comes from the Choctaw bayuk for "small stream". The modern delta of the Mississippi formed over the last seven millennia, as silted-up areas kept on forcing the river to find a new route. The shape of the current birdfoot delta is a perfect example of distributaries "stealing" water from the main river to the point where the distributaries have it all, and the main river has none. What you are looking at is southern Louisiana. Follow the current river course past Baton Rouge and New Orleans down to the present, aptly named, birdfoot delta, where there's nothing left of the original river, and use this as a guide to the other lobes. Three ancient lobes have stayed west, while four have move east in the direction of the current delta, with a remarkable tendency to flip-flop quite regularly. This is the sequence these delta lobes occurred: orange, pink, dark green, light green, light blue. dark blue, pale yellow. But that was just to show the flip-flopping. For the sake of simplicity, as we list them by age, we'll separate them by area, the western ones to the left, the eastern ones to the right. We'll go by color code of the lobe, how many years ago it occurred, and its direction. Over the past several millennia, this process has caused the Louisiana coastline to move south 24-80 km (15-50 mi). But before we start reviewing the eastern lobes, first we have to clarify the situation with Lake Pontchartrain, which, like the geologic story of this whole area, was a surprise to me. Lake Pontchartrain is that oval body of water that stands out so obviously on any map of the New Orleans area. It's unusually large for a lake, especially in this area, but that never really got me suspicious. But now researching it, I'm amazed to find out it isn't a lake at all! It's a bay, perhaps a lagoon, of the Gulf that functions as an estuary. While freshwater streams feed it, the tide enters as well through that strait you see out to the Gulf. And as it turns out, the "lake" was created some 2,600 to 4000 years ago, seemingly by accident. Suppose you had oceanfront property with a nice view, and then someone started filling in the ocean across from you, and then building on it. That's what happened here. The north shore of Lake Pontchartrain was open coastland, and then the Mississippi slowly started pushing silt ahead of it forming delta after delta and grew on the side opposite this shore. What the Mississippi built became the south shore of the "lake" on which New Orleans eventually grew. This satellite image of the area should show it better. The north shore is original, the south shore is the eastern riverbank of the Mississippi on which New Orleans stands. The river typically meanders—even the entire French Quarter is within one meander, bulging to the south in the middle of the white area. To the west can be seen the meanders along "Plantation Alley", each one coveting riverfront property. On the "lake", the road causeway can be seen crossing the very middle, and other roads go around the sides. As for trains, when I came down from New York on the Crescent in 2007, the train came through Slidell, the town at the upper right, then over a bit of the lake into the city. When we leave on the City of New Orleans to Chicago, the train will not cross the lake but skirt it in a huge arc around its western shore. Now that we know about Lake Pontchartrain, look at this map showing coastal changes in SE Louisiana (Map by Dboutte). As you see the lobes growing over time, see how the coastal bay area that became Lake Pontchartrain got captured, and barricaded in by the evolving delta system. It's a left-over piece of the Gulf, like a bubble being captured in the manufacture of glass. Or in Swiss cheese? Now we're ready to go back to the map of the seven deltas. Review how the four eastern ones (which were interspersed by the three western ones in an eternal flip-flop) progressed to where the river ends today, all while trapping the waters of Lake Pontchartrain in the process. The first two of these lobes moved east, the light green lobe forming that island area, but then the river "changed its mind" and moved southeast instead. What it formed in that last lobe is known because of its shape as the Birdfoot Delta, where distributaries take all the water and go their merry way. We'll discuss the Birdfoot Delta when we get there—this is the area I meant when we talked about "going south" out of New Orleans. Start at the right, where you can't miss the Birdfoot Delta, with two of its main distributaries, South Pass and Southwest Pass. Above New Orleans we again see Lake Pontchartrain. On the right we again see the Sabine River, the border with Texas, and the Red River flowing into the Mississippi. Or is it? Hmm. But let's concentrate on the center. 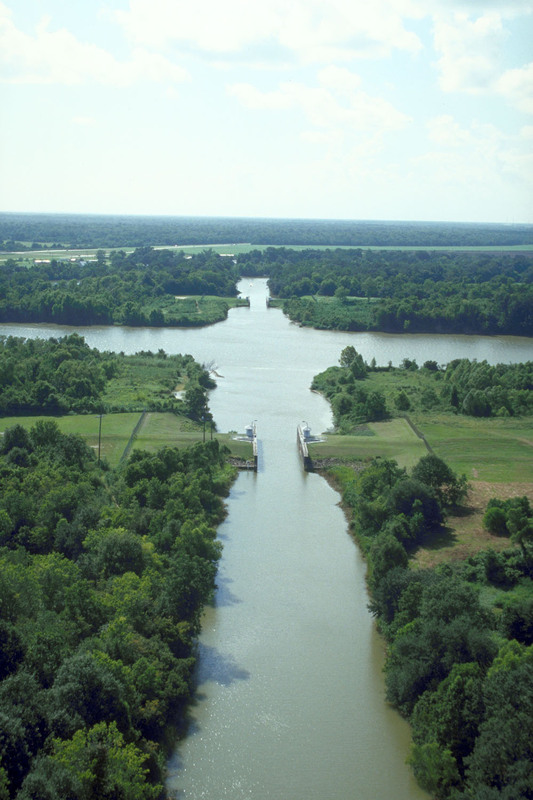 We see Bayou Lafourche (la fourche=the fork in French), which had once been the Lafourche Delta, a one-time course of the Mississippi, which then changed its mind, leaving its former course as a full-fledged distributary flowing into the Gulf. This is where the Madewood Plantation I stayed at was located. The only problem with Bayou Lafourche is that it's been tampered with. Where it exits the Mississippi at Donaldsonville, it was dammed in 1906, which cut off nourishment and replenishment of the huge area of wetlands around the bayou. The formerly flowing bayou became a stagnant ditch. However, there are plans to reconnect the bayou to the river at Donaldsonville where the amount of water entering the bayou can be controlled, and its water quality can be improved. Click to see that Bayou Tèche today gets no water from the Mississippi, but instead from local, smaller bayous. It passes St Martinville, and new Iberia, and never reaches the Gulf on its own, but enters the Atchafalaya at Morgan City, and the combined streams flow into Atchafalaya Bay in the Gulf. Before we go back to the previous map, notice how the Atchafalaya varies from being a river to spreading out into wetlands. You should also be able to spot a couple of oxbow lakes on the Mississippi. While the name Tèche is French, there are two radically different explanations for its origin. One hypothesis is that comes from a local Indian word, tenche, meaning "snake", referring to the bends in the stream. But it's also been proposed that German colonists in the area used the word Deutsch to name it, and Tèche is a French rendering of Deutsch. But go back to the previous map and check out the Atchafalaya (at.cha.fa.LA.ya) River. The name comes from Choctaw hachcha "river" and falaya "long". It's an honest-to-goodness distributary of the Mississippi, spreading out into the Atchafalaya Basin (Photo by Chrismiceli)—click to admire. The Basin is about 70% forest and 30% marsh and open water, and is the largest block of floodplain forest in the US. The Atchafalaya River and marsh ends in a delta, which is unique, because it's growing. Growing? Doesn't that sound ominous? Also, look back up where the Red River goes into the Mississippi, and the Atchafalaya River comes out of it. What's that all about? And what's the story on the Atchafalaya Basin being located right where that orange lobe was, the very oldest one of the Mississippi? Is the Mississippi sending water down its original course again? The seeming mystery of the truly amazing Atchafalaya will become clear with this set of diagrams. We see that the Red River a thousand years ago did not start out as a tributary of the Mississippi, but ran parallel to it, entering the Gulf on its own. Running parallel was a dangerous thing for it to do, and sure enough, Ol' Man River bounced out one of its meanders westward, which was enough to capture the Red River, just like a frog shooting out its long prehensile tongue to capture an insect. This was only a half-millennium ago. But the Red River didn't want to stay captured, and, shortly after it entered the meander, it exited again, and stayed in its original riverbed to the Gulf. It's hard to imagine another situation where any river ever did this in-and-out action. But we have two choices. We can continue to call both the tributary and distributary two different parts the same Red River, or yield, and give the distributary a new name, the Atchafalaya. However, when we do so, we have to realize and admit that the Atchafalaya is simultaneously a distributary of the Red and Mississippi Rivers, which is really quite amazing. The remaining four diagrams show the confusion resulting from the hand of man attempting to disrupt what the Mississippi had done. It's hard to follow what happened with the upper part of the meander, the lower part, plus a channel dug. In sum, it's an attempt to control the river, and limit how much water exits here down the Atchafalaya. In periods of flood, more is sent down the Atchafalaya to keep the river lower at New Orleans and other downriver communities. But the Atchafalaya under normal circumstances gets the water of the Red (so is the Red really a tributary of the Mississippi?) and about 30% of the water of the Mississippi, with 70% going down to the Birdfoot Delta. This makes the Atchafalaya the fifth largest river in North America, by discharge. This satellite image shows the sediment plumes emanating into the Gulf from the Atchafalaya and Mississippi Rivers. It shows that that's a lot of mud coming down the river, and also that it uses two exits. We have here another map like we saw before, that compares the size of all these rivers, but also gives more information. Let's review it again, knowing what we now know. The main connection, by volume of water, is between the Ohio (helped by the Tennessee) and Lower Mississippi. It's almost humorous how much less the Upper Mississippi and Missouri provide in comparison. We see the Arkansas/White contribution, but then see the truth of the matter, that the Red flows into that man-made complex of waters, and then out the Atchafalaya. We now understand what the earlier flow map showed, that the Atchafalaya discharges much of the water. This map also shows that there's a secondary channelized exit for the Atchafalaya through Wax Lake, so that there are actually two deltas for the Atchafalaya. With all the water passing down this route, we now understand why its delta is growing—actually BOTH its deltas, just like the ancient orange lobe we saw. We also have a map that shows the detail of the area around the lower Atchafalaya as it passes Morgan City and enters the Gulf at the bottom. You also see the channelized diversion through Wax Lake. The Wax Lake outlet was dug in 1942 to help protect Morgan City from flooding. All the serrated lines represent all the levees needed in this area. We see both the Intracoastal Waterway that we saw in Texas, and also Bayou Tèche coming to end in the Atchafalaya. We also see that both of them cross the Wax Lake Outlet like highways cross others at intersections. This is Bayou Tèche in the center and the Outlet running left-right. To see that the double Atchafalaya delta is growing, take a look at this satellite image. Everything breaks down into distributaries as the dual deltas expand into their own birdfoot pattern. You can also make out the Intracoastal Waterway at the bottom, and the meandering Bayou Tèche above it. It can be reasonably argued that the Mississippi has two mouths, the Birdfoot Delta and the double Atchafalaya Delta—but let's not confuse the issue. But wait! There's even a THIRD exit, although it's not a delta. If you recheck the above waterflow map, you'll see where, n 1931, the Bonnet Carré Spillway was built to send excess Mississippi water in flood emergencies into Lake Pontchartrain, so that the water continues beyond into the Gulf. This makes a lot of sense, now that I know that it isn't a lake, but a branch of the Gulf, anyway. However, it seems it's only opened a certain number of days, and only in certain years, evidently corresponding to flood emergencies. Changing deltas is what has happened repeatedly over the millennia. Such an event would leave both Baton Rouge and New Orleans in a backwater at best, and at worst, with no river at all. There are many believe that this will actually happen someday, despite all efforts, due to natural forces inherent in rivers and their deltas. An alternative possibility is that the Mississippi could break through into Lake Pontchartrain instead to get a new route to the Gulf. This would be the less devastating, since Baton Rouge would not be affected, and, rather amazingly, New Orleans would still be on the river, except that the river would flow to its north, rather than to its south. The river could take either the Lake or the Basin route if flood-control structures are swamped or heavily damaged during a severe flood. You see I-10 and then US 61 northbound, but we now know a lot more about this area, so let's locate more places. You see New Iberia, where Shadows-on-the Tèche is, with Bayou Tèche nearby. You see the lower Atchafalaya going to Morgan City, and also the Intracoastal Waterway. But the major purpose of this map is to illustrate the local part of the Great River Road, in red. It's not a single road, but bits and pieces of local roads that are close to the Mississippi, from its source in Minnesota to its mouth in Louisiana. Because of levees, you can't always see too much of the river, but can cross it, or get up on top of a levee to see it. We'll be using bits and pieces of the Great River road going down to the mouth, and on the September trip. Now note this: New Orleans is immediately off this map to the right. The part of the Great River Road in "Plantation Alley" is just called River Road, mentioned earlier. We won't be going along it here, but I did when I saw the houses. So, going upstream on this newest map, find San Francisco Plantation, then Oak Alley, also Houmas House. You see Donaldsonville, where the Bayou Lafourche takes off along that southbound road, and Madewood Plantation (not shown). Then you find an error. Laura—that Creole Plantation--isn't at all located where shown, it's just to the east of Oak Alley, down the road, which is why I saw both in the same afternoon. It makes sense to break up the long drive to Natchez in the middle, but I couldn't help myself. On our extended itinerary in 1969, we'd visited both Evangeline sites, Grand Pré in Nova Scotia, and St Martinville in Louisiana, in the historical sequence, as it turned out. But we saw each one only fleetingly. In 2008 I came back to see St Martinville much more completely (2008/4), and last year revisited Grand Pré much more thoroughly (2014/20). But as I mentioned in that writeup in advance, it didn't make sense to come so close to St Martinville again now and not take a quick peek, which would mean seeing both sites again within a year's time. It would only add an hour to the trip, 20 minutes each for going, visiting, and coming back, and would break up the drive. So at Lafayette, which is a center of the Cajun Country, let's pull of on US 90, which, by the way, is called the Evangeline Thruway, and then cut across east on that first gray road to St Martinville (not shown). The back roads are a little confusing, but conquerable without error. We stop in St Martinville, and the street signs (Photo by Christophe Landry) leave no doubt of the heritage. Next to the church is the St Martinville statue of Evangeline we saw in the past, posed for by Dolores del Rio when the film was shot here and donated to the town by the film's cast and crew. I also found out the St Martinville and Grand Pré are twinned as sister cities. In order, they show the Evangeline Oak down next to the bayou; the short but beautiful boardwalk along the bayou; and a panorama (click) of Bayou Tèche in St Martinville. It's REALLY worth making this fleeting stop. Our short 20 minutes allotted are up, but this just a revisit, after all. But we won't backtrack. Google has found a path for us on the other side of the bayou, so we cross the old bridge over the bayou and set off through the fields to cut over to I-10 three exits after we left it. We succeed without getting lost, but find some sights of interest along the way. Isn't serendipity fun? A short way out of town, we see growing in fields along the road what is unmistakably sugar cane (Photo by കാക്കര), the cane-like stalks giving it away. Shortly thereafter, we get stuck behind a truck (Photo by Mariordo) transporting harvested canes somewhere, with the cut canes (Photo by Rufino Uribe) bobbing up and down in the truck in front of us. We manage to pass the slow-moving truck, and shortly thereafter, see where it's headed, a local sugar mill (Photo by Arivumathi) looking a lot like this one, but with some smoke rising from the refining process. Then the open green fields reappear all the way to the interstate. Driving along the interstate, we don't pay too much attention to when the roadways diverge and rise up a little (Photo by Jane Doughnut). They merge and separate, but it becomes apparent we're riding at treetop level (Photo by Patriarca12), and that the next exit is a considerable distance away. We realize we're on a causeway, the nice kind, on columns, that doesn't block waterflow, and we must be going over the wetlands in the Atchafalaya Basin. Sure enough, we can see water (Photo by Samlikeswiki), and shortly afterwards we can clearly identify our crossing high above the Atchafalaya River. Later research tells us that the causeway we've crossed is the Atchafalaya Basin Bridge, actually a pair of parallel bridges that run for 29.29 km (18.2 mi), making it the second-longest bridge in the US. Checking our map confirms that's the case, and before long, we approach the Mississippi and cross it into Baton Rouge. Some quick urban maneuvering, including a confusing left exit, changes interstates, which shortly afterward deposits us on US 61 northbound. This, again, is a surprise, since it's very much like a parkway, with large lawns on either side leading up to forest land. There are few traffic lights, and it's a surprisingly pleasant drive, not only on the Louisiana side, but, as we cross the border, on the Mississippi side as well. We finally arrive in Natchez. Historical Maps Driving with a contemporary map will get you where you're going. It will show we've driven in three states today, Texas, Louisiana, and Mississippi. And then you're done and maybe look for somewhere to take a nap. But driving with a historical map in your head, at least, is a much more rewarding academic and cultural experience. It's also much more fun and ties things together not only on a monochronic (one-time period) level, but also on polychronic (multiple period) levels. Let's look again at this map we've used before, showing the expansion of the United States. Three states, maybe, but five historical expansion areas. In driving from Galveston to Natchez, and quoting the years the areas joined the US, we started in the Republic of Texas (●1845), crossed the Sabine River into the Spanish Cession (●1819), that triangle of land Spain ceded to fill in the space between the Louisiana Purchase and the Sabine. Everything we saw today was in this triangle. 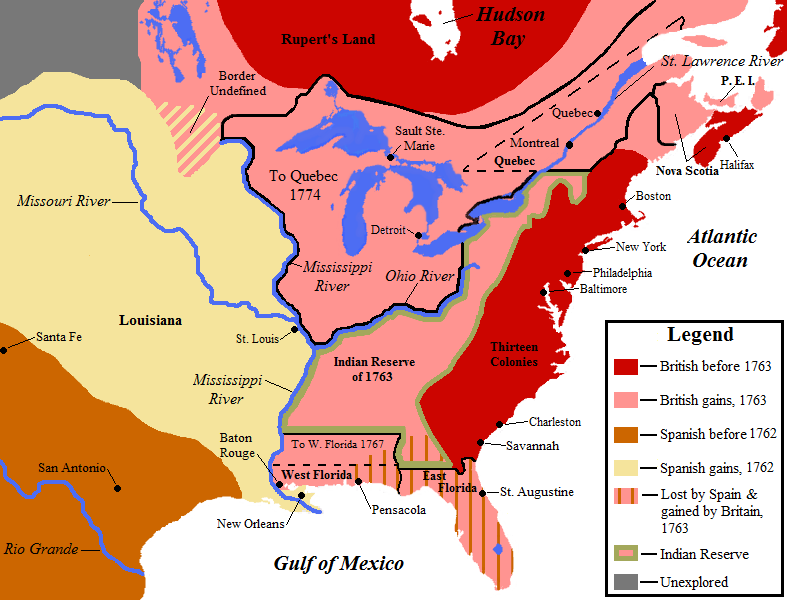 We then at some unknown point, crossed over into the Louisiana Purchase (●1803), which lay on the west bank of the Mississippi, plus New Orleans on the east bank. That means, when we crossed the river into Baton Rouge, we were entering the other Spanish Cession of West Florida (●1819), which had been ultimately subdivided between three states. Finally, when we shifted north, crossing into Mississippi, we finally crossed the most significant of these borders and entered the original United States (●1783), as declared by the Treaty of Paris that ended the American Revolution. There are precious few places where you can cross so many historic areas at once—but these are ALL around the mouth of the Mississippi River, which perhaps should be more expected and surprise much less. Finally, now that we're back in the original United States, let's clarify a bit about its relationship with the Mississippi River, particularly with the Lower Mississippi, its new natural border beyond the previous natural border of the Appalachian Mountains. When picturing Early America, we so often just picture a map of the Thirteen Colonies on the east coast, and not any more than that, particularly what they looked like when the US became a country, a significant stage. First inspect this map of the Colonial Provinces of Virginia and Carolina (no attribution). These two provinces ran from the Ohio down to Spanish Florida, and from the east coast to the Mississippi. (Disregard overlapping claims of each of them on the map and concentrate on the accepted borders.) Virginia was named after Elizabeth I, the Virgin Queen and was located on the coast. But it claimed land beyond the Appalachians to the Ohio River, but reaching the tiniest piece of the Lower Mississippi. Carolina was named after both Kings Charles I and Charles II, and was also located on the coast centered in what is today North Carolina. It, too, claimed land beyond the Appalachians up to the Lower Mississippi north of Spanish Florida. 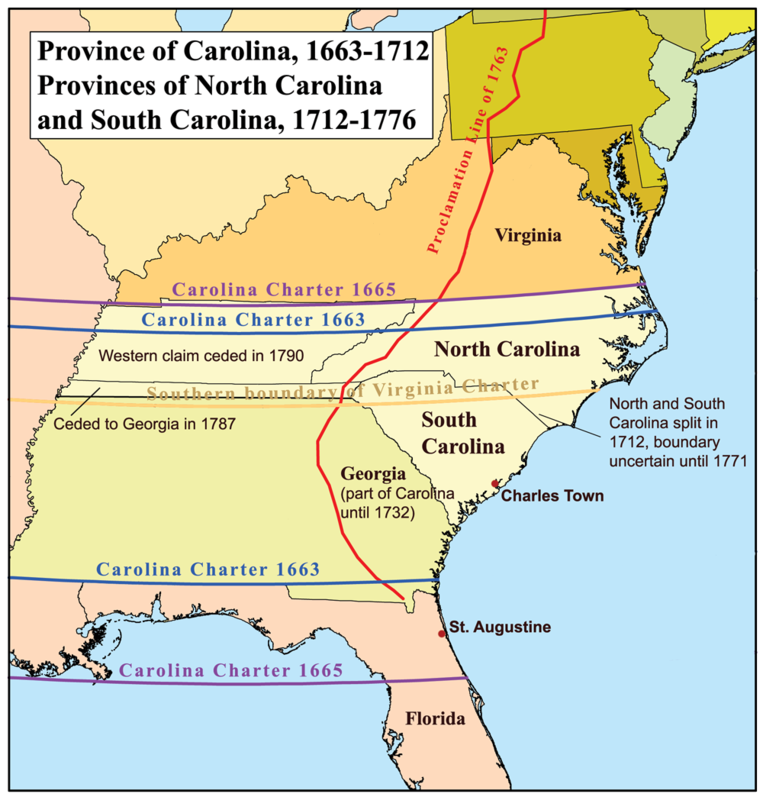 At various times in the early 18C, the Province of Carolina split three ways. Georgia broke away under a new name, in honor of King George II. The rest of Carolina had an acrimonious political split. Apparently each wanted to keep the Carolina name, so they shared it, as North Carolina and South Carolina. (Imagine if all three had wanted to keep the name! We might have North, Central, and South Carolina today, Georgia being South Carolina!) Once Carolina became three provinces, North Carolina still reached a considerable stretch of the Mississippi; South Carolina had a miniscule claim that it eventually ceded over to Georgia, so was no player here; and Georgia had by far the most frontage on the Mississippi compared to North Carolina and Virginia. Fleetingly, let's look at this map, centering roughly around 1763 (Map by Jon Platek) and the Treaty of Paris of that year that ended France's war with Britain. The Thirteen Colonies are still clustered along the coast (this is the colonial map we most often see), and the Appalachian Mountains are still the inland border for all practical purposes above and beyond all claims to the Mississippi. Britain claims for itself a lot of territory beyond the mountains; note particularly the Indian Reserve of 1763 and the area known earlier variously as Upper Louisiana or Illinois Country—it's that wedge between the Upper Mississippi and the Ohio Rivers. At this point it became part of the British Province of Quebec, but for a short period of time. Now jump twenty years later, roughly to 1783 (Map by Kmusser) and to the Treaty of Paris of that year that ended the American Revolution. This is the map, beyond the Thirteen Colonies maps so often seen, that people should also be aware of, because this is the original United States, before any later expansions. 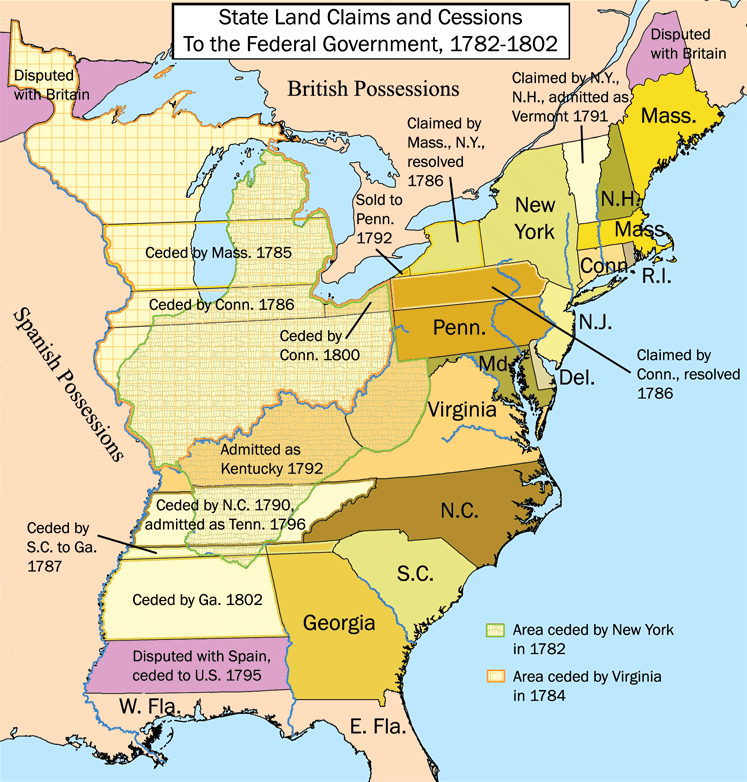 But check out all the dates of changes in the western areas of this map, and how many changes took place in the NEXT twenty years between said independence in 1783 and the Louisiana Purchase of 1803, which radically altered the picture. Let's just concentrate on the three areas involving the Mississippi and Ohio Rivers. What had been ●Upper Louisiana or Illinois Country, which had then become part of the British Province of Quebec for those two decades, now gets passed over to the United States. What a flip-flop of fortunes. We'll see how that affected local French speakers when we get to the Upper Mississippi in September, notably Ste Genevieve, Missouri. But anyway, this area becomes known in the US as the Northwest Territory, that wedge between the Upper Mississippi and the Ohio, to be divided into new states. All states ceded to the US government all claims to lands beyond the Appalachians to allow for new states to be formed there as well. But of course, the old borders dividing the area are still there. ●Virginia's westernmost area becomes Kentucky, which now has Virginia's former miniscule piece of frontage on the Lower Mississippi, and most of its Ohio River frontage. Then, during the Civil War, western counties of the remaining part of Virginia choose not to secede, and become the new state of West Virginia, and which point Virginia has no more frontage on the Ohio River, either. That leaves ●Carolina, and the two states that have inherited its river claims. The western part of North Carolina first becomes Franklin, then later Tennessee, which gets all of North Carolina's Mississippi frontage. But the biggest area is Georgia's claim to the river, with by far the longest frontage. This eventually gets subdivided into nearby Alabama and further Mississippi. Then when West Florida is subdivided, Louisiana gets a piece, and each of these new states gets a piece to give them Gulf coasts, but, since East Florida never was subdivided, Georgia never got its logical Gulf coast and remains just an east coast entity. This is purely my speculation as to how and why the state got its name, but it seems a highly logical explanation. We'll resume the narrative in Natchez in the next posting.